Once upon a time, the Instagram Explore page served up a little bit of everything. Based on what accounts you follow and what you like, the Explore page would aggregate similar posts, meme accounts, celebrity news, comedy videos, and whatever food craze was trending at the moment, like Crossushi, or rainbow pull-apart bread. Now, apparently, the Explore page looks like a lifestyle ‘gram — beautifully curated images without a weird meme in sight. Unsurprisingly, there’s already backlash. So far only select users have received the Explore update, and they aren’t too happy with it — the main complaint being “where are the memes?” Some have described the new Explore page as a feed of “aesthetically pleasing photos,” or, ouch, a “wannabe lifestyle brand.” It doesn’t sound all that bad, tbh, but we do love our memes. 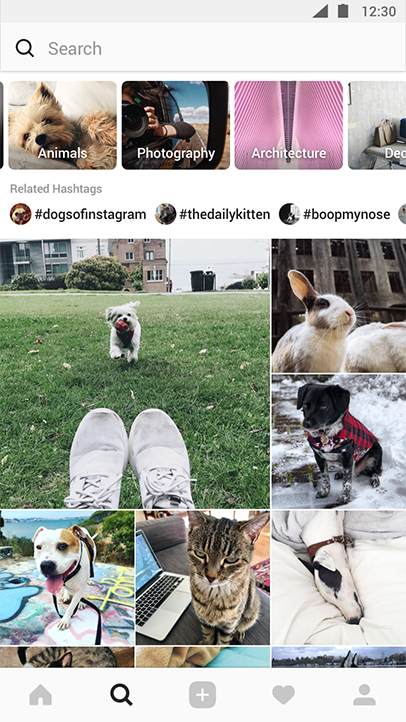 On May 1st, Instagram announced at the Facebook F8 developer conference that changes would be made to the Explore page. “Explore is still personalized for you, but the content is now organized into topic channels so you can browse across your interests and go deeper on any area you’d like,” the company said in a statement. The new Explore example they gave included “Explore categories” at the top of the page, and the example feed was very much in line with the “wannabe lifestyle brand” criticism heard on Twitter. Anyone else's Instagram explore page lost all of it's memes?! I went to scroll through the sea of dank memes and they're all gone! It's just full of aestheticly pleasing photos. I want the memes back.